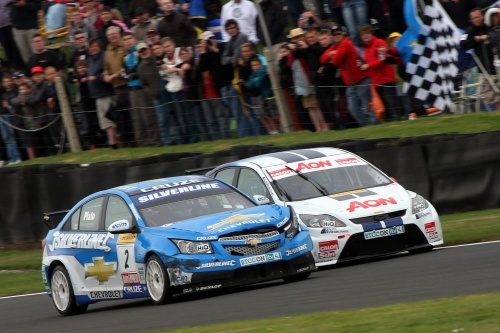 The BTCC was at Oulton Park over the weekend and had BRDC members involved in some great racing. The first race was won by Tom Onslaw-Cole after a dominant pole to flag race. After an incident at Island hairpin on the first lap, Tom broke away from the field followed closely by Gordon Shedden and Rob Collard. Although under pressure from Gordon and Rob throughout the remaining laps, Tom kept his cool to take the chequered flag by 0.348 seconds and secure his second victory of the season. The second race saw another member coming home for the win. This time the honours went to Jason Plato who started from 10th and carved his way through the field during more early lap incidents to find himself fourth. From there, he took Tom Chilton at the Island hairpin and followed it with a near-identical pass on Mat Jackson the next lap. All that was left for Jason to do was pass the in-form Tom but, not without causing some damage to both cars. Matt Neal had a good run late on in race two to claim the second step of the podium having finished eighth in the first race. Matt went two better in the final race of the day and won a great race from eighth on the grid. A mix of misfortune for his competitors in front and some daring passing moves gave Matt his third win of the season. Jason (90points) now trails Matt (98 points) in the Drivers Standings, whilst Stephen Kane is a further 8 back from Jason on 82 followed by the impressive Onslaw-Cole on 76 points.